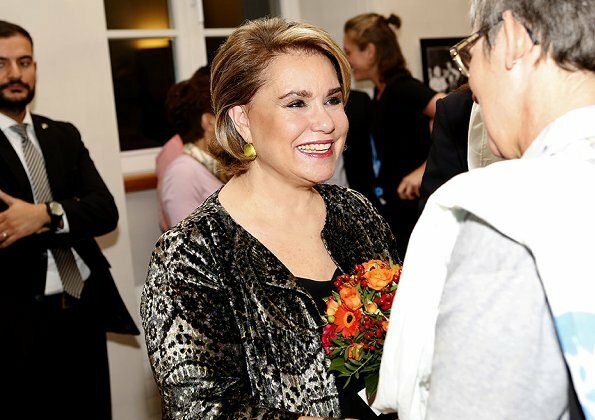 Grand Duchess Maria Teresa of Luxembourg attended opening of the exhibition "Stop Poverty: Acting for Dignity" held by ATD Quart Monde in Luxembourg. ATD Quart Monde (ATD - All Together in Dignity) is a movement of solidarity among and in collaboration with the most excluded families around the world. Founded in 1957 by Joseph Wresinski, ATD Fourth World brings together women and men from all cultures and social classes and is active in 34 countries. I love her look in this outfit. It is similar to earlier times, but is much softer minus the huge shoulder pads and more lush fabric in the simple coat. I can understand her love of the look with slacks and not wearing a skirt. They are much more comfortable, a good length and fullness. The more restrained eye makeup looks better, too. This is so much better than the boxy jackets she wears so often. It still covers up but is softer and more flattering. The pants elongate her figure. The shoulder pads attract the eye to the top and away from the hips and legs.